I have been warned to keep things short, that less is more. But my brother recently reminded me of the wisdom of Fraiser Crane. In preparing a project said, “Ah yes, but if less is more, imagine how much more more could be!” But I know you might feel churched out, which is a good thing to be….so I’ll see. I’ve been wondering about the perfect, most creative way to share all the gratitude in my heart. I’ve tried that before and failed. The last time I offered words at this church outside of a homily was my eighth grade graduation. I remember how I ended my speech. I ended by quoting Forest Gump. I ended my specch by saying, “Life is life a box of chocolates. Thanks for making mine delicious.” I remember waking up the next morning thinking, “Did I really say that?” Let’s hope I can do better than that today, but I’m afraid the sentiments will be the same. Whenever I don’t know what to do, I look to Fr. Joe, the closest thing to Jesus I’ve ever found. He said, in moments like this, tell them three things: Thank you, I’m sorry, and I love you. So thank you. I’ve been at St. Charles a long time, as a student, an employee, a parishioner, a webmaster (until two days ago), a seminarian, a deacon, and now as a priest. I’ve spent most of my life here. It’s been a great life. Every time I came here, I always thought in the back of my mind, this is a special place and I’m lucky to be a part of it. I am so thankful for this parish because it is how I met Jesus, it is how I fell in love with him. I am thankful for you all–my teachers, priests and sems and religious, friends from grade school and college and seminary and even Guatemala. I’m less thankful for what you’ve given me, the gifts or things you’ve done for me, and far more thankful for who you are to me. Because you are Christ to me. Second, I’m sorry. Most of you know how far I fall short of the standard Jesus sets out, how undeserving I am of this office. And I agree. I went and visited Fr Charlie’s grave last week. He died 7 years ago on May 28. Nearby his grave was a dandelion. I smiled because he once told me he always thought of himself as a dandelion of the priesthood, but that God can do good things even with a dandelion. I still don’t know why God called me to be a priest, and I’m pretty sure I’m more of a weed than a geranium, but God willed the weeds and redeems even a dandelion. But I’m sorry for any weediness you have experienced through me. Third, I love you. I’ve been excited for this day for a long time, largely because it’s an excuse to have all my favorite people together in the same place. A while back, Ashley, our awesome youth minister, and I were having a deep theological discussion where we always do, at Chick-fil-a. At a certain point, we were planning a retreat. She paused for a moment and said to me, “Do you think they have any idea how much we love them?” It is a sentiment I feel deeply for everyone here. I never thought my heart would feel as big as it does right now. A brief word about this Eucharistic procession that we will do now after I shut up. We Catholics believe that John 6 is true, that Jesus is fully present in the Eucharist, which is why he bothered to institute the priesthood in the first place. When we receive the Eucharist, we receive Christ: he comes into our bodies, our veins, our souls, our dreams. That same Christ floods the body and veins of the Church and even further, he floods the veins of the world, the streets and alley ways and corners and hopes of a world that has lost its way. 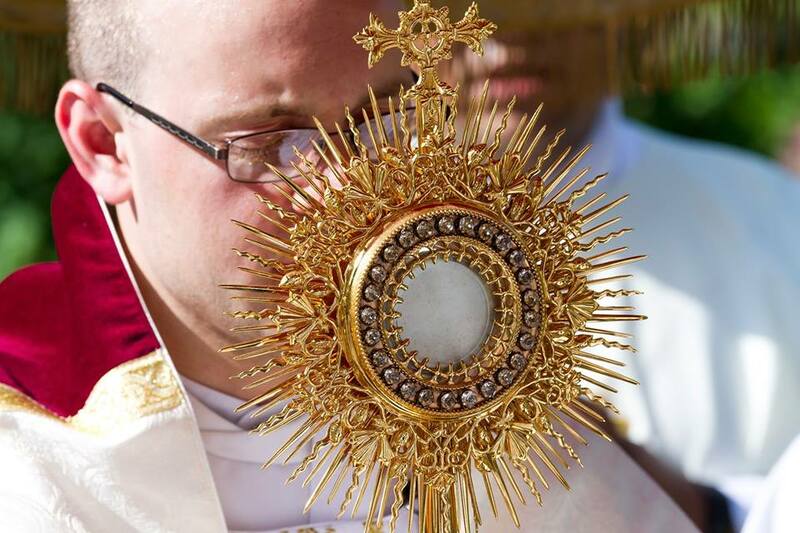 We Catholics have traditionally on this feast of Corpus Christi done processions, in order to fill the world with love, flood the streets with Jesus. Pope Francis does one every year and so do parishes around the world. Today we will do it. Together let us fill the world with love. Let us fill the world with Christ. This entry was posted in Eucharist, St. Charles. Bookmark the permalink.